It is a difficult yet exhilarating challenge to define, let alone describe, what is going on in Algeria because, frankly, it is compelling drama, with lots of heroes, broken yet defiant leaders, and enough uncertainty to keep us up nights wondering what’s next. We do know this: President Abdelaziz Bouteflika will not run for a fifth term, and instead is attempting to find an exit strategy (if indeed he is part of the planning at all) that will buy time for the elite power structure (le pouvoir) to maintain their primacy while allowing some changes to their grip on power. He was forced out by an overwhelming and growing consensus among most of Algerians that he should not run. His first instinct, reflecting his coterie’s survival instincts, is to find a way to have a peaceful transition of authority to whatever or whoever comes next, ostensibly to lead a national effort to develop a plan for the next generation of leadership. Who is this opposition? According to numerous reports, it cuts across all demographic, geographic, and societal groups in Algeria, from veterans of the war for independence to socialists and Islamist party members. Yet the energy is clearly driven by the young people under thirty who make up half of the population and are more than 25% of the unemployed. The demonstrators seemed to have learned from the failures of the Arab Spring as they continue to build momentum without resorting to violence or acquiescing to promises from the regime that will not change the power dynamics in the country. Although without a formal leadership, despite a variety of spokespersons emerging to comment on various issues, there seems to be an understanding that merely replacing Bouteflika with more of the same, even if from a younger generation, will not suffice. Nor will proclamations calling for a national dialogue absent an inclusive participation of all elements of society resonate. The demonstrators are hanging on to their insistence that a new slate of players emerge who can move the country forward towards a restructuring that will both revitalize the political space in the country and reverse its economic decline and maddening lack of opportunities for those not connected with the ruling elites. The country’s economic and social ills, ranging from lost billions of dollars in energy revenues with little to show for it, an educational system that ill-prepares graduates for the few jobs available, the lack of economic diversity to generate jobs outside of the energy sector, crumbling infrastructure, neglected development of the interior and rural areas, and the ever present threats from extremists and militants such as al-Qaeda in the Maghreb (AQIM) are among priority concerns, none of which will be resolved through decrees or distributing excess funds the country has little of. 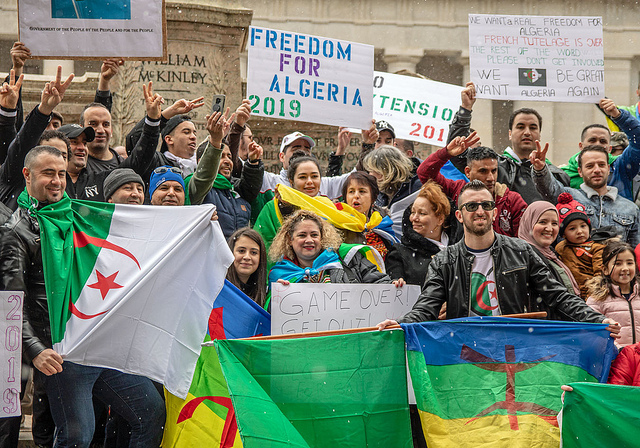 It is the spirit of the demonstrators that is most engaging, from the women veterans of the resistance to the young pre-teens who are tired of seeing their older siblings desert Algeria to find employment elsewhere. Bouteflika’s change of heart is only the first step to meet their demands. Among the catalog of their priorities are a clean break with the past, a technocratic government to disrupt the status quo and eliminate the worst excesses of corruption and cronyism, a functioning social system that provides for the people and prepares them for gainful employment without discrimination, and the development of a government of institutions that protects their dignity and their futures. In the days and weeks ahead, the protests can take on either confrontation or reconciliation. The role of the military, which was radically shaken up inside the regime last year, has still to make its presence felt in the decision-making apparatus. Perhaps it is also facing its generational challenges and recognizes that it can follow either the model of Egypt or Tunisia in responding to the demonstrations. The future of Algeria is a significant watershed in the Arab political space and the outcomes of the current challenges will certainly have an impact far beyond its borders.